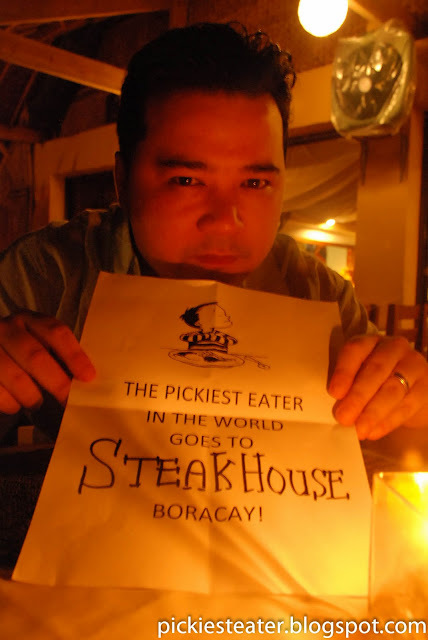 Steakhouse Boracay is located at the second floor of a building in Station 2, (It actually looks like a big house, but the signs are pretty huge so you won't miss it), and in the tradition of most of the restaurants in Boracay, it's an open air. 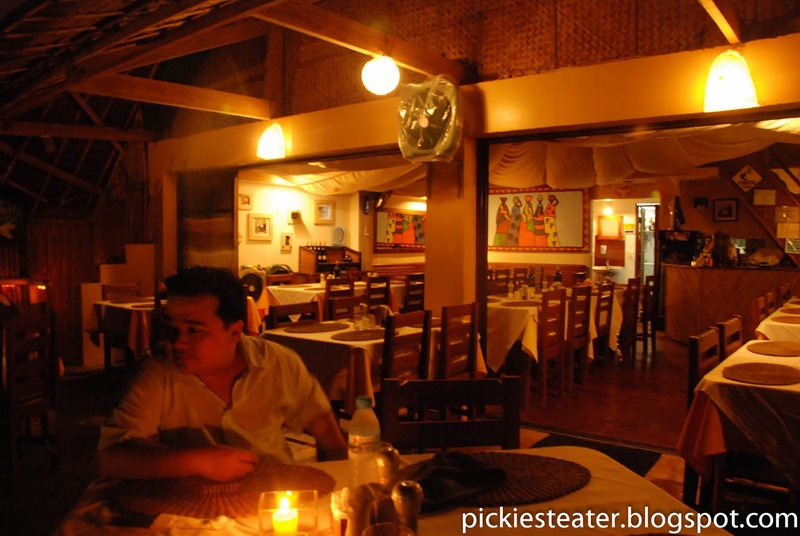 The place is dimly lit and simply furnished, easy to feel at home in. 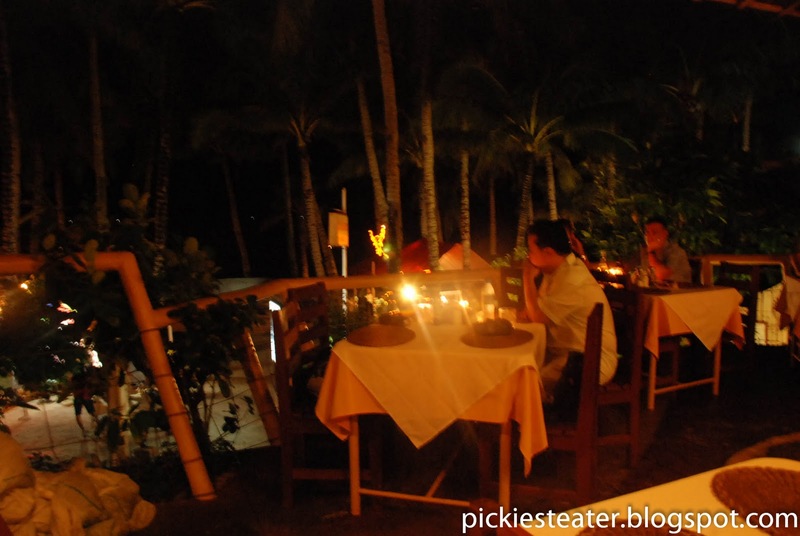 My wife.. Candle Light dinner, the beach.. and Steak.. life as it should be.. 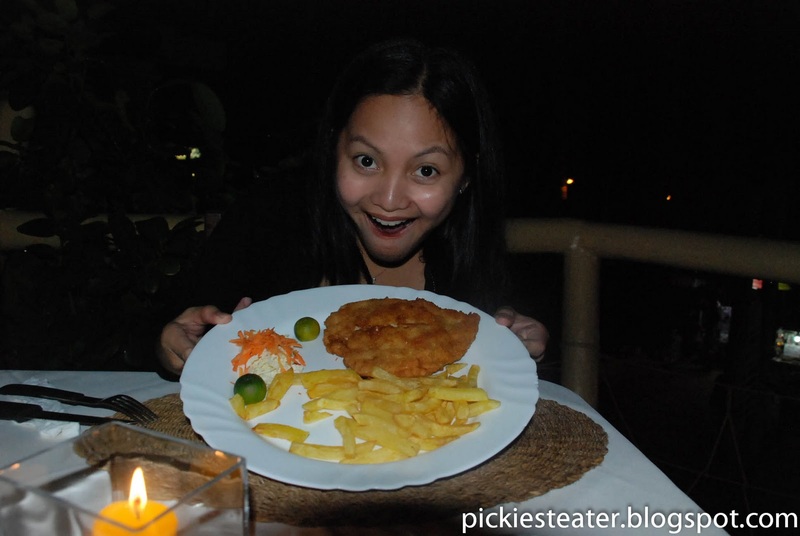 Upon receiving her food, Rina was rather pleased with the size of her Chicken Cordon Bleu with french fries, but I was not pleased with the price (P410). It was a bit steep for Cordon Blue. The fries tasted like the ones you can have made at home, but are tasty and quite addicting nonetheless. I just don't know if it was restaurant quality though - especially at that price. There used to be french fries where that little blank spot is. My lightning quick hands struck again. 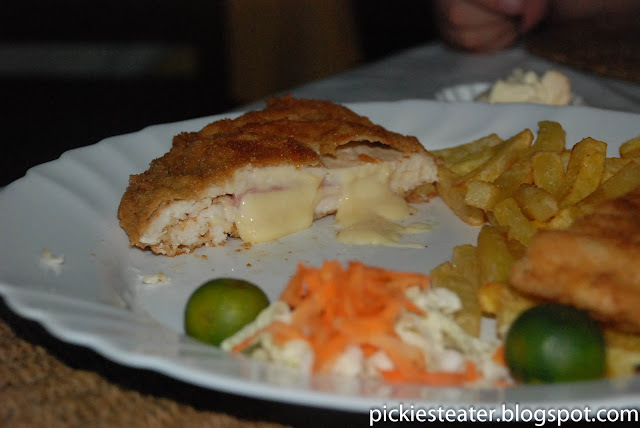 The Cordon Bleu was flatter but wider than what I'm used to, but that worked fine for me, especially since they normally use white breast meat for it, which I'm not too fond of. In my opinion, Making it flatter helped make it less dry, and brought out the taste of the ham more. As long as there's cheese in it, Rina will love it, and this was was actually quite packed with cheese, to the point that it started oozing out when Rina sliced through it. 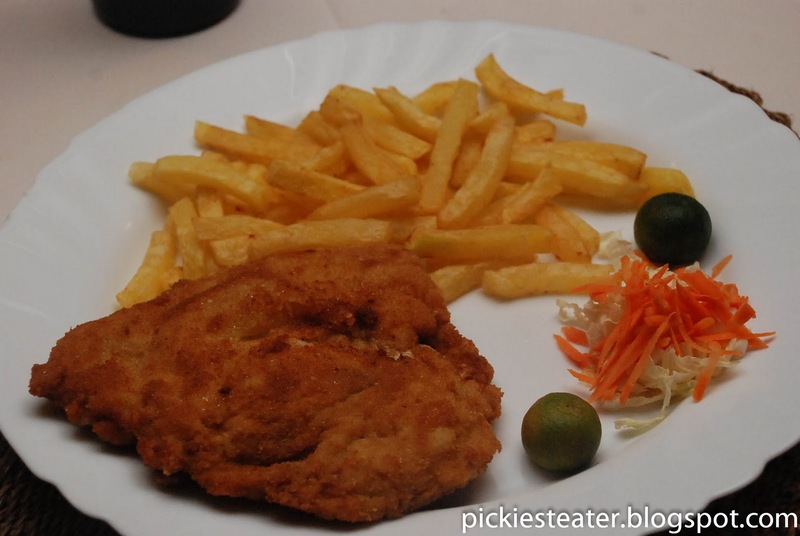 The chicken meat was wonderfully cooked, and the crust was done just right. All in all, a good dish, but a bit over priced. 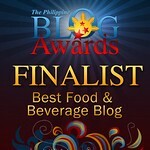 Since it was the Steakhouse Boracay, I couldn't face the readers of this blogger without trying the specialty of the house. And since the waitress said it was the fattiest of all the meat cuts in their selection, I ordered the Imported Rib Eye Steak (P495). 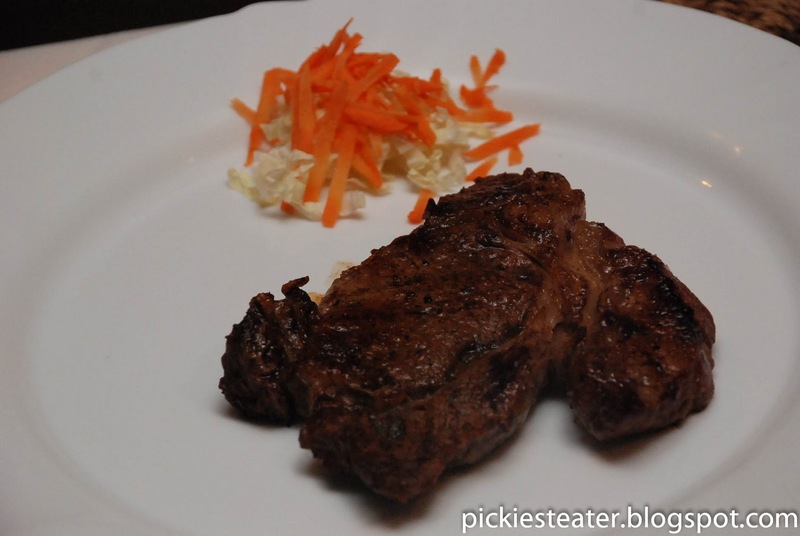 I found the shape of the Rib Eye Steak they gave me kind of odd. Usually the top of the steak is the side that's line with fat, right? this one had the fat lined up right down the middle, and both sides were weirdly proportioned. Everything about it looked rather boring. Although It was a very reasonably priced steak, (especially when compared to the Cordon Bleu), you can see that they skimped out on the size in order to lower the cost. Not to mention the fact that the plating was really boring. They basically just slapped it on a plate with some shredded carrots and lettuce. I was hoping for even a little bit of french fries or mashed potatoes, but nada. And here's the strange part about their menu: The waitress told me that local steaks come with a choice of Dijon Mustard Sauce, Herbs butter, or Pepper sauce. The imported ones, do not. They'll give you A-1 or Lea & Perrins upon request. But that's about it. Kinda strange, don't you think? Shouldn't the more expensive dish be the one with more goodies to it? 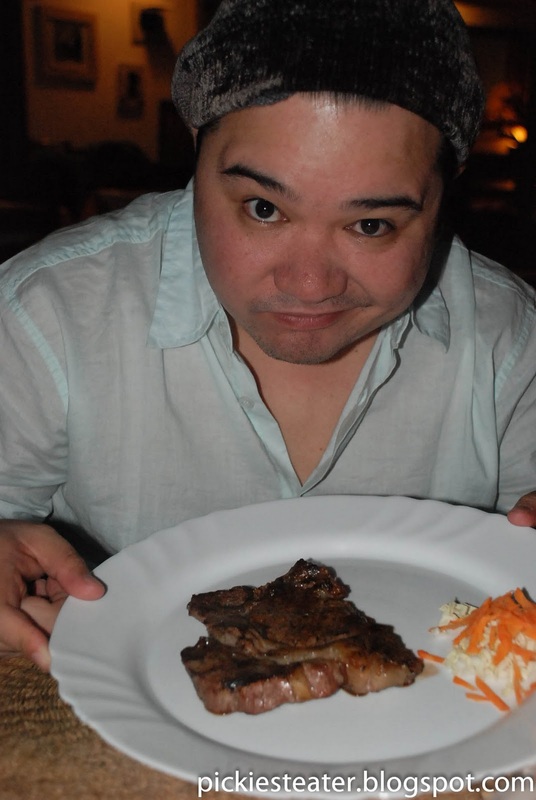 At any rate, it wasn't as soft as I had expected an imported steak to be. That's not to say it was extremely tough, either, but if this was what the Imported steak was like, I'd hate to imagine how tough the local one would be. Taste wise, it was quite juicy and its natural flavors were delicious, except maybe just a tad bit over cooked (I asked for it medium well), they gave it to me well done. A bull's skull. Very appetizing. 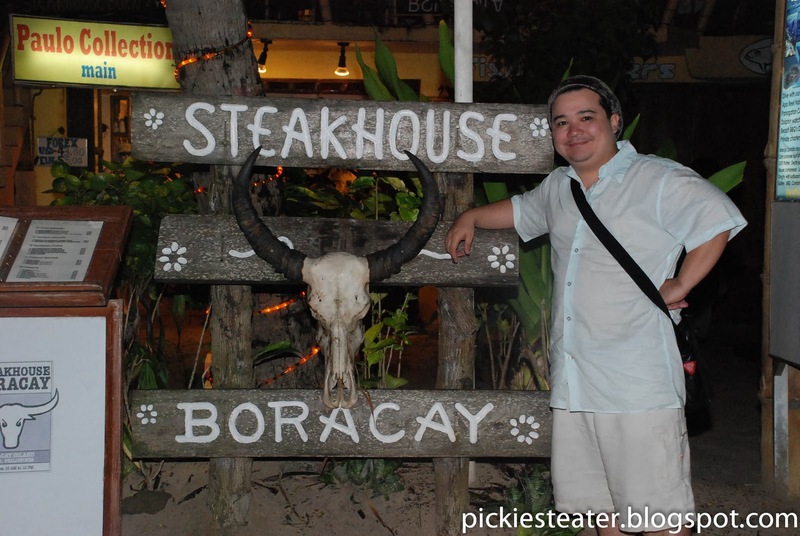 The food of Steakhouse Boracay was good, but to me, the prices were a bit much considering what you get in return. Although I'm glad we were able to enjoy what would be our last meal at the island paradise in a quiet (to Boracay standards) and intimate restaurant, I couldn't help but wish we tried the popular (but we were told, geographically undesirable) "Mama's Bar & Chill Out Lounge" for German and Austrian food instead. You're welcome! The Cordon Bleu was really good! 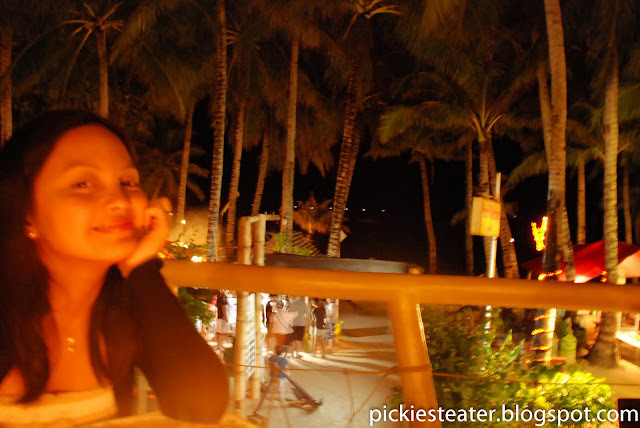 THE BORACAY CHRONICLES: RIDE THE HYDRO ZORB!